My husband, Eric, and I got married in July 2016, starting our family of 5 – Eric, our 3 bulldogs, Turk, Mayo, and Paul, and me. In January of 2018, we decided to expand our family by one more and brought our beautiful baby girl, Remi Monroe, into the world on October 17, 2018. 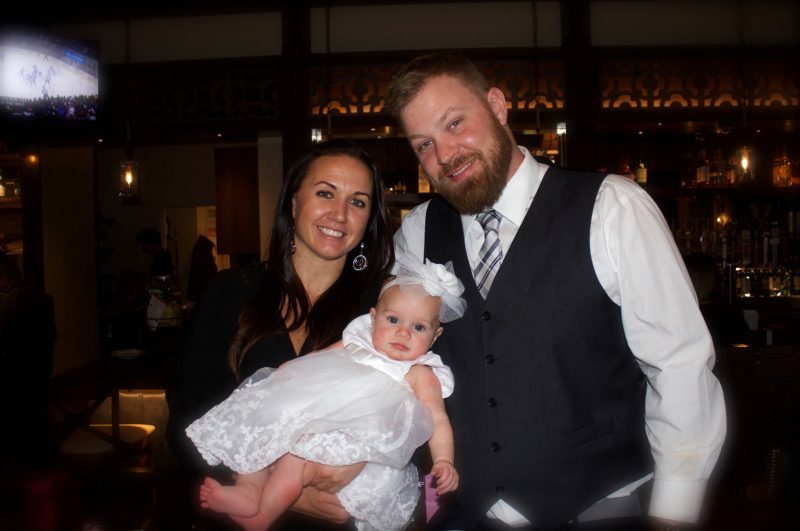 While I was pregnant, we were told that we were both carriers for the CF gene and that there was a 25% chance that our child would have the disease. Because we didn’t want to risk complications and because it didn’t matter to us one way or the other, we did not do any testing during my pregnancy. We just knew that we would love this child no matter what came our way. About a week or so after bringing Remi home from the hospital, our pediatrician gave us the results that Remi had two genetic mutations consistent with cystic fibrosis patients – Remi was diagnosed with CF. Immediately after, we were introduced to the CF team at Stony Brook hospital and began her tests and treatments right away. We are so very grateful that the science exists today that allowed us to learn of her diagnosis early, to start her treatment regiment, and to find out as much information about CF as possible. We see the amazing team at Stony Brook once a month and find comfort in those visits, knowing that the support system is there. Remi is now 5 months old and has already accomplished so much in our eyes. She is sitting on her own, eating new foods, rolling around, giggling, playing with her toys and the dogs, and has two teeth! She is a very happy baby and brings us so much joy with her fun-loving personality and the cutest little smile. “Since we have found so much joy in staying active and playing on teams, we are excited to pass that passion down to her… with the added bonus that it will help her in her daily fight against CF." 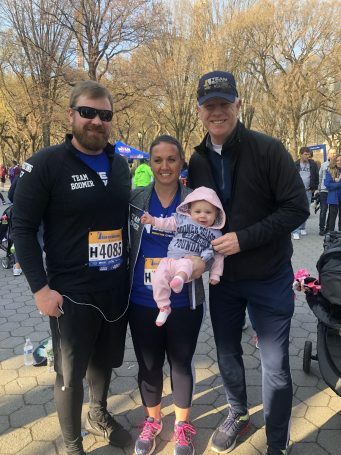 How did you learn about the Boomer Esiason Foundation and Team Boomer? We learned about BEF through our team at Stony Brook. We also received a hand-written letter from Boomer himself soon after Remi’s diagnosis – and later learned that an old family friend has a friend who works there and coordinated it. What made you want to get involved with Run to Breathe and Team Boomer? After learning about the Foundation, I started to research it more and found so many inspirational stories and saw so much support being provided through BEF that we decided to see how we could get involved. At first, we were skeptical about getting so involved without Remi’s consent, as we will want her to make the decision about how public she wants to be about having cystic fibrosis. But, for now, until she can make that choice, we thought it was only right to help bring light to the disease and the foundation and to help change the lives of people living with the same disease as our child. Our parents, siblings, in-laws, friend, coworkers, and teammates have continued to share our story in an effort to raise awareness and funds for CF. Our Team for Run to Breathe has raised over $8,000 collectively. We are so lucky to have so many supportive people in our lives and are happy to be a part of such an amazing organization! Why do you run and exercise? Eric and I were both very involved in sports growing up – Eric excelled in football, basketball, and lacrosse, and I in soccer, basketball, and lacrosse. Eric went on to football at Stony Brook, and I played lacrosse at UMass Amherst and then University of Louisville. Athletics has always played a huge role in our lives – and still does today! We both play in adult leagues for various sports, and I coach soccer and lacrosse at Riverhead High School. When we found out that exercise and athletics are a key part of compliance and treatment for people with cystic fibrosis – we knew we could help Remi as she grows up. Since we have found so much joy in staying active and playing on teams, we are excited to pass that passion down to her… with the added bonus that it will help her in her daily fight against CF. When Remi was diagnosed, Eric and I made a promise to each other that we will continue to stay active so that we can participate in events like Run to Breathe with her and so that we can keep up as she grows up.